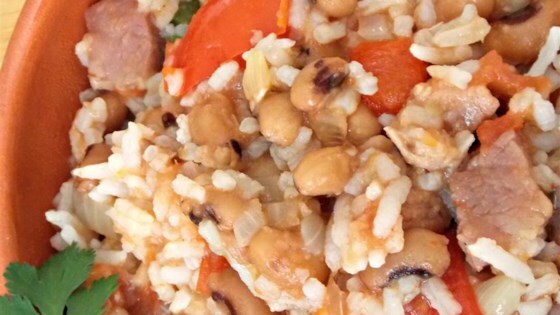 "My grandma always made Hoppin' John on New Year's Day when I was growing up in Virginia. I now live in New Mexico and decided to put a hot Southwestern spin on the recipe this year, hence the name. It's simple and tasty, and has some heat. I only added two jalapenos, but you could add more if you like it hotter. If you don't like hot food, you might want to eliminate the jalapenos completely. My husband and I both loved it." Melt butter in a large pan over medium heat; cook and stir onion, red bell pepper, jalapeno peppers, and garlic in hot butter until onion is translucent, about 5 minutes. Stir cooked rice, black-eyed peas, diced tomatoes with habanero peppers, bacon, salt, and black pepper into vegetables. Cook for 10 minutes to blend flavors, stirring frequently. Enjoy Hoppin’ John on New Year’s Day, and it’s good luck all year long! This dish could easily be made vegetarian by leaving out the bacon, but pork is a traditional ingredient in Hoppin' John. Greens are also a traditional ingredient, but I did not include them here. You could probably top some raw greens with this and have a tasty salad. Great and simple recipe. I adapted by using red rice (healthier), another kind of beans, and I stirred in some left-over taco saus. Delicious. Very good. Spicy? Yes! That can be toned down though to suit your tastes. So easy! I used some leftover ham chunks instead of the bacon. Delicious. Thanks! Whole family liked it. Since they don't enjoy super hot, subbed small can of mild green chilies for jalapenos and can of regular diced tomatoes for Rotel. Thanks! Loved it!! Didn't change anything. Saved the juice from the drained Habaneros to add some salt and viniger and use for hot sauce later.